Instant Tethering allows you to share your Wifi connection acting as a “host”. In short, Instant tethering makes your device a router point. This feature was recently introduced by Honor in EMUI 5.0. This all new features is now widely rolling out for Google Pixel and recent Nexus phones & tablet devices. 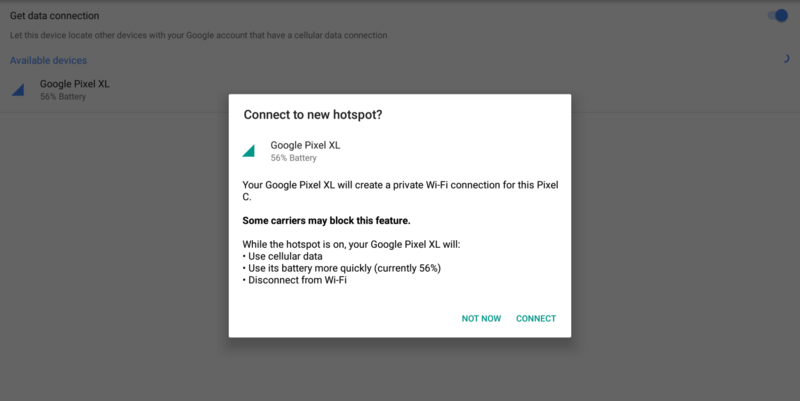 You can automatically share a cellular data connection between certain Pixel and Nexus devices via Wi-Fi when they’re signed in to the same Google Account. For example, you can automatically connect your tablet to the Internet using your phone’s data connection. The latter set of devices must run at least Android 6.0, while 7.1.1 Nougat or above is needed to be a host. Importantly, both devices must be signed into the same Google Account. Play Services 10.2.98 or later is needed, but the feature seems to also require a server-side component. Under “Personal,” tap Google > Instant Tethering. Check that both devices are signed in to the same Google Account. Check that Bluetooth and Wi-Fi are on. On your other device, you’ll get a “Wi-Fi hotspot available” notification. Tap it. To connect, tap Connect. If you have multiple host phones, first tap the phone you want. To not connect, tap Not now. To connect later, open your Settings app > Google > Instant Tethering > your phone > Connect. To change your Instant Tethering settings, tap Configure. With some carriers, the first time that you tether, you’ll see a verification notification. Tap Continue. On your phone, when you connect, you’ll get a “Sharing data connection” notification. The notification stays as long as you’re connected. To disconnect, tap the notification. When you don’t use an Instant Tethering connection for about 10 minutes, it disconnects. When tablets lack a connection, but nearby hosts maintain cellular data service, a notification will appear on the former device noting ‘Wi-Fi hotspot available.’ Pressing ‘Connect’ will begin the process, with users being able to manually initiate by heading to Instant Tethering settings. As the Instant Tethering feature consumes a lot of battery, it is advised to plug in the device while Tethering. Also, the Tethering will automatically disconnect after 10 minutes of no usage. There’s still no confirmed news of whether other Android devices will receive this feature. Currently the feature is exclusively for Google devices.